Picking up the Dragons & Tigers Award from the Vancouver International Film Festival with his debut Eighteen(2009) and then earning a slew of invitations to global events with his widely praised sophomore outing Sleepless Night(2012), JANG has quickly built a reputation for himself with his calm, introspective works. All of his films mine experiences from his own life and each feature a character that acts as director’s surrogate: the teenage boy in Eighteen, the young husband in Sleepless Night and now a researching director in A Midsummer’s Fantasia. Visiting Busan for the second time with his third feature film is JANG Kunjae, whose pensive and romantic A Midsummer’s Fantasia, a co-production between Japan and Korea, is screening in the Korean Cinema Today: Vision lineup. Split in two parts, the first half of his new film, which is shot in luminous black and white, is documentary-like restating of JANG’s research trip to Gojo, a small city in the Nara prefecture, as he prepares to make a commissioned film for the Nara International Film Festival, produced by famed Japanese art house auteur KAWASE Naomi. Featuring interviews with local characters in the sparsely populated and elderly community and a languorous tour with a guide from the local city hall, the film then switches to colour and goes back in time a few years to focus a brief friendship and possible romance between the guide and visiting Korean woman. Shot for 11 days during a month long stay in Gojo, A Midsummer’s Fantasia blends Japanese and Korean sensibilities in a rural area that has lost its youth to local urban economies. The slow lifestyle of the community is exacerbated by the necessity of real time translation between the Korean and Japanese characters. Following the dry recreation of the monochromatic opening segment, JANG shows us a story, simple, sweet and steeped in nostalgia, and presumably informed by the research described in the first half. The film becomes a meditation of the creative process, as well a document of a community’s evolving humanity. JANG’s latest debuted as the opening film of the 5th Nara International Film Festival in September. - Your film is shot in two languages and the first half features a lot of real time interpretation. Did this pose a difficult in filming, and was the slow nature of communication something you wanted to capture? The main Japanese actor in Japan, his actually a close friend of mine that I’ve known for about five years. Due to our relationship, the language barrier wasn’t much of a problem as we already knew how to communicate with each other. Furthermore, he was aware of the acting style I favor, which is to express things in a natural way. At first, it took some time to get through scenes as we finish a take. The assistant director, who was Japanese, would check it to give his perspective and following that the director of photography would also offer his point of view, thus we all work together but slowly, due to language constraints. Though slow, I felt it was important to get everyone’s input, and soon the work became quicker as we grew comfortable with one another. It may have been chaotic at the beginning but it turned into a strong working relationship. 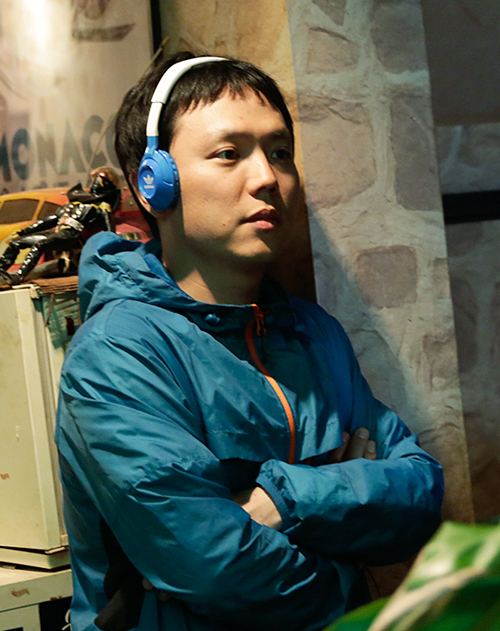 Within the film, the slow nature of the translated dialogue was definitely something that I wanted to capture. - The first segment feels like a documentary. Was this why you choose to film in black and white? Actually all the people interviewed in the first half are real residents, not performers. I visited Gojo to do research and the interviews I wound up were repeated for the sake of the film when I returned for filming. The first time I went to Gojo, I felt I had discovered a somewhat vacant place with a lonely air. Gojo is a town that has lost its youth to cities and as its elderly residents grow older, it is in danger of dying out. I wanted to express this feeling by filming in black and white as this seemed like the best way to capture it. - Your film features some very long takes, and extremely natural performances. How did you rehearse these with your actors? My experience with this film was a little extreme actually. The first part was planned in advance but everything that happens after the transition with the fireworks wasn’t planned out ahead of time. Every day we shot with no script and no locations. We just figured everything out on the spot. For my actors, I would just tell them a few key words and themes they should focus on, but we didn’t rehearse. The main characters had already become quite accustomed to my shooting style following our work together on the first segment. Furthermore, the director of photography didn’t really have any experience in long takes due to his career in commercial work, but by the end of the shoot had become quite comfortable with this shooting style. - How influential was Kawase Naomi as a producer on the production. The main difference between us was that the location was her homegrown, a place where she has worked for more then 20 years. She knows everything in the area and particularly of the scenery. While I, as a first timer to the region, was more focused on the people and their conversations. I felt it was important for us to balance our two different styles. Scenery and nature are very important in her films, where my focus is on characters. Of course I understood her style and furthermore, as a relative newcomer compared with her extensive experience, I’m glad that we were able to find a mutual understanding. - You seem to take a special interest in the Gojo region, with its elderly characters and timeless atmosphere. What drew you to it? Actually the area was suggested to me as this is an official project of the nearby Nara International Film Festival. Furthermore, we were introduced to this town and its city hall also pledged its support. Initially I planned to shoot part of the film in Tokyo and Seoul but as the project took shape I opted to shoot the whole thing in Gojo. I mentioned to some Japanese actors that they might be able to visit Seoul for some shooting but sadly that didn’t take place. However I’m thinking of shooting a coda in Seoul, though I don’t know what shape this idea will take. - Your style as a director has become more concrete over time, and you seem to favor a still camera that is conscious of its protagonists but also the nature around them, particularly through the distance you put between the camera and characters. Is it important for environment to be a part of your films? Over time I’ve changed the way I think about style. For my first film I thought more about the story than the style but with my later films I began to consider the visual aspects, in addition to the narrative demands of my stories. The distance of the characters from the camera wasn’t really my choice as I left it up to the DP to do as he saw fit. But since the look of my films has come to be somewhat similar, perhaps this is a reflection of my style as a director. - I love the music in film. It is simple but always changing. How did you work with your composer on this film? Actually I worked on some of the music myself with the main actress. The last song was half Japanese and half Korean. The music composer is another friend of mine and we discussed this last year at the Busan International Film Festival, when she was there with the indie drama Pascha, which she had worked on. - I noticed the framing you use in the film. Might I ask if OZU Yasujiro or other Japanese film makers were an influence, other than KAWASE? It’s impossible not to be influenced by all these great filmmakers. I used to focus on style of Ozu, NARUSE and KUROSAWA though now I’m very keen on the way they used narratives in their films. These days I tend to focus on more modern Japanese filmmakers who are strong storytellers, such as KOREEDA Hirokazu and AYOMA Shinji. - Your first film deals with teenagers, your second with a newly married couple. A Midsummer’s Fantasia talks a lot about the elderly. In your work you seem to have explored every stage of life, but what exactly were you trying to explore in this film? To be honest, that progression wasn’t my intention but perhaps it represents the fact that I am ageing along with my films. However, on the inside I still feel like a teenager. - On that note, the film begins by focusing on the elderly and as is progresses its gaze falls on younger characters. While the duo at the end are not children, the end of the story feels very sweet and innocent. It’s almost as if time runs backwards. Was this your intention? That wasn’t my plan but I feel the same. The narrative eventually turned out that way. For I felt it was important to make if feel young and alive, particularly at the end with the fireworks and the children running around. We talked a lot about the ending between the young man and woman, as we weren’t sure what would happen. Maybe they leave each other forever at that moment or they sleep together, or perhaps just kiss? We didn’t really know until the very end. - Finally, this was your first international co-production. How was that experience for you? 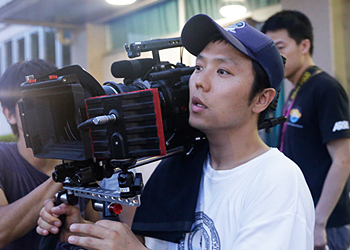 For Japan and Korea, co-production status is normally reserved for big films. There are a couple indie co-productions, but these are few and far between. I discover that there’s a lot you need to consider when making co-productions, and ultimately you end up with a mess of ideas, styles and cultures.